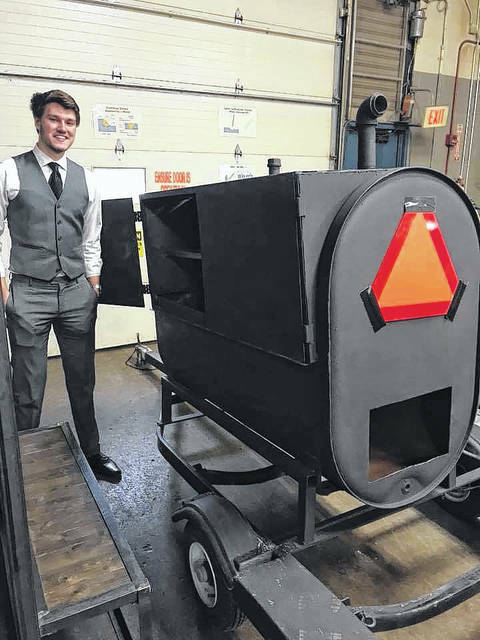 Delaware Area Career Center welding senior Nick Gerold stands next to his completed senior project, a smoker made from an old fuel tank and jet ski trailer. Gerold said the project took about 40 hours to complete. Senior Ian Salvador made the winch bumper that is now on his truck. He said he worked on the project for more than 36 hours. Senior Joseph Blair rests his arm on his senior project, a metal cabinet designed to store art supplies for the Arts Council. Blair said he still has to polish it up a little bit and add locks. He worked on the project for about 48 hours. 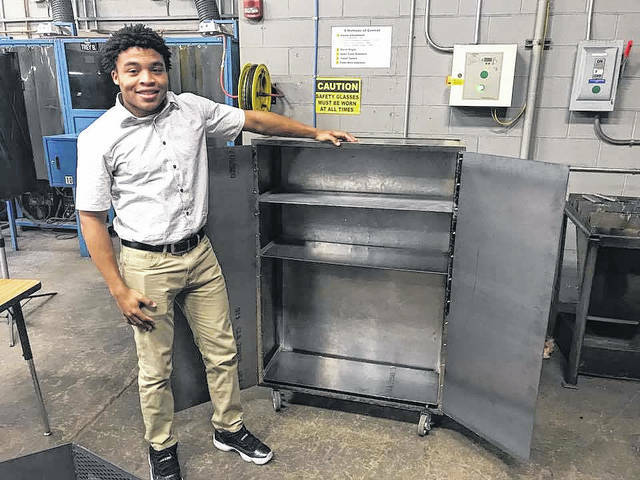 Seniors at the Delaware Area Career Center recently turned in the projects they’ve been working on all semester and said they learned a lot from the process. Welding instructor Brad Dement said he told students last semester to begin thinking about their projects and said students had about 15 different deadlines to meet this semester. “They had to interview a professional, come up with a product, give a presentation and build a portfolio,” Dement said. Dement said giving the students hard deadlines helped with to build their time management skills. “Some of them thrived in that but they all learned about time management,” he said. Senior Ethan Jefferson said when he began designing his project, he wanted to make something big like a go-kart. However, crunched for time, he instead created a metal grandfather clock. “I wanted to make all kinds of things, but ran out of time, so I made time,” Jefferson laughed. Jefferson said the clock stands six feet tall and sits on a tripod rather than a column because a regular base made out of metal would have made the clock too heavy. Jefferson said he learned that creativity is a double-edged sword. He explained that he didn’t design blueprints for the clock the first two times he tried, but said he would have to start over because it didn’t work out the way he wanted. But he said his creativity is also what gave him the idea to rest the clock on a tripod. “Creativity can be good and it can be bad,” Jefferson said. Another senior, Nick Gerold, said he liked the way senior projects were laid out and they way they are adaptable to everyone. Gerold said he decided to really challenge himself and build a smoker. Gerold said the smoker is an old fuel tank and its trailer is an old jet ski trailer. Gerold did lament that he hasn’t had a chance to smoke any meat in it yet and hoped he could do it over winter break. Joseph Blair said he decided to make a cabinet for his project to he could donate it to the Arts Council after it’s finished. “I wanted to do a cabinet for the community to use as art storage,” Blair said. He said the project helped him expanded his experiences and thought process. “It was kind of challenging, but it expanded my thinking. It took me about 48 hours. I’ve just got to polish it up now,” he said. 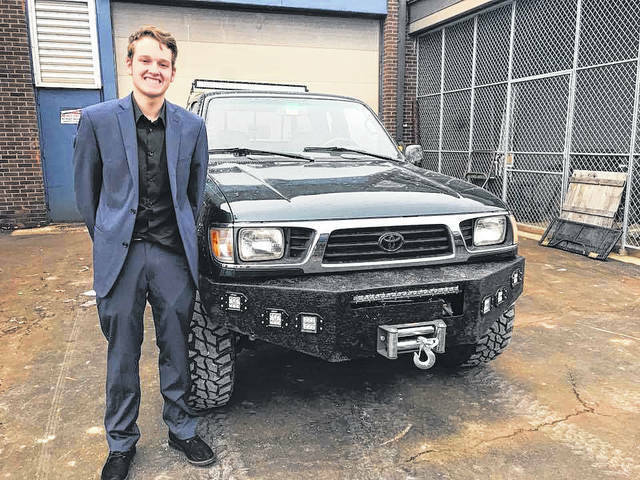 One of the most high-stakes projects belonged Ian Salvador, who built a custom winch bumper for his truck. Salvador said he spent all of Saturday and Sunday of Thanksgiving break creating a cardboard bumper to for his truck to make sure all of his measurements were accurate. Salvador joked that he was extra cautious because the bumper was going to be on his truck and he wanted to make sure it was perfect. Dement said seniors in his class can spend next semester doing job placement or on-the-job training with welding professionals. He hopes the senior projects give them new opportunities. Contact Glenn Battishill at 740-413-0903. Follow him on Twitter @BattishillDG. This entry was tagged DACC. Bookmark the permalink.